According to the Bible, Onyx is the middle gemstone in the fourth and last row of the High Priest's breastplate (Exodus 28:20). It is derived from the Hebrew word shoham (Strong's #H7718) whose root word means "to blanch." The same word is used to delineate the fifth stone that adorned Lucifer (Ezekiel 28:13). Shoham is translated as "onyx," in both Exodus 28:20 and Ezekiel 28:13, in all ten of this series' Bible translations reviewed. The Bible also states that the fifth foundational stone in New Jerusalem (Revelation 21:20), which is like the onyx, is called sardonux in the Greek (Strong's #G4557). Strong's states the word refers to the nail of a finger (probably due to its flesh tone color) and both it and Thayer's lexicon translates the word as "sardonyx." 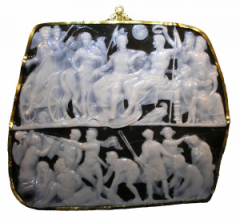 Thayer's states the sardonyx (onyx) was a stone containing red and white colors. Onyx and Sardonyx stones are a variety of agates, which themselves are a variety of chalcedony. Onyx gemstones possess black and white bands that tend to be parallel with one another. A Sardonyx (the prefix "sard" means "red") has parallel red or reddish bands instead of black. The Bible reveals that onyx stones were found in the "whole land of Havilah" (Genesis 2:11). This gemstone is referred to at least eleven times in Scripture, more than any other precious stone. King David, after he officially made his son Solomon the new human ruler over Israel, set his heart to collecting and preparing materials for building Jerusalem's temple. One of the special materials he collected for the temple his son would build was onyx gemstones. Why will a New Jerusalem be created? What made King Solomon wealthy? Anciently, according to the Catholic Encyclopedia, this precious stone was mined in Egypt, Arabia and India. It has a long history of being used in jewelry and in pottery items such as bowls. An onyx stone worn around the neck was believed to cool the passions of love. This made it a popular gemstone to wear in India. One major side effect, however, of wearing the stone was that it supposedly encouraged discord and separation of couples (Curious Lore of Precious Stones, pages 98 - 99). Does Scripture forbid wearing jewelry? How great is the love of God? Where is the temple's Holy of Holies? Curious Lore of Precious Stones, 1913 ed. Diamonds, Pearls and Precious Stones, 1913 ed. Gemstones in the Breastplate, 2008 ed.